Numerous factors impact a senior’s ability to live independently, such as health and memory problems, mobility issues, and care coordination concerns. Often overlooked is the fact that one quarter of all nursing home admissions are the result of poor medication adherence. Representing a loss of independence, being placed in a nursing home is a difficult milestone for both seniors and their families. It is also costly for seniors, their families and the health care system. The cost of a single room in a nursing home averages more than $ 200 per day and close to $ 200 billion for all Americans annually. About 62 percent of this cost in the United States is assumed by public, taxpayer-financed sources such as Medicaid and Medicare. Almost half of seniors aged 65 and older take at least five different prescription drugs regularly, and one in four take between 10 and 19 pills each day according to data compiled by Kelton Research. In addition, more than half of seniors admit to not taking their medications as directed, and the adherence rate decreases as the number of daily medications prescribed increases. Salditch’s company developed Medicine-On-Time, where local pharmacists sort and organize medications into personalized pill cups labeled with the day, date and time to take them. Pharmacists provide all the pill cups to the patient organized into colorful calendar cards. It’s convenient, easy-to-use and, most importantly, proven effective to help people maintain independence and enjoy better health. A study released in the American Journal of Geriatric Pharmacotherapy found that seniors using Medicine-On-Time were 66 percent less likely to be admitted to a nursing home. “It is an all too familiar process – adult children sorting their parents’ medications into pill boxes,” Salditch says. 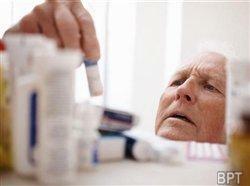 “Medicine-On-Time puts this process in the hands of licensed pharmacists and in doing so helps to ensure safety and accuracy, helping seniors maintain their independence and their quality of life.”Believe it or not, research conducted by Prince Market Research shows that seniors fear moving into a nursing home and losing their independence more than they fear death. The same study found that baby boomer children of seniors also fear for their parents, particularly their parents’ emotional and physical well-being should they have to enter a nursing home. Free trials and a tool to find the closest pharmacy offering the Medicine-On-Time service can be found at sortmymeds.com. Additional information on Medicine-On-Time can be found at www.Medicine-On-Time.com.